Monday: The Donald interviews The King! Don't miss Monday's show when Donald Trump turns the tables on Larry and interviews him on his past 25 years at CNN! LKL tonight: Larry takes on NBA star LeBron James on his home court! 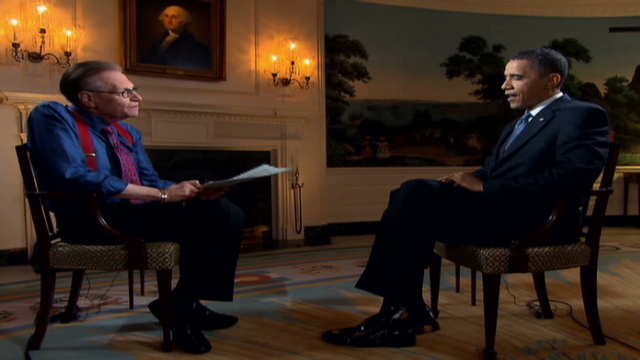 President Obama goes one-on-one with Larry King on Thursday night to talk about the oil spill, economic turmoil and war. Watch"Larry King Live," at 9 p.m. ET. Washington (CNN) - President Barack Obama told CNN's Larry King on Thursday that he is furious about the Gulf of Mexico oil spill, but his job is to fix things instead of just yelling at people. "It's an extraordinary privilege to wake up every day and know you have the opportunity to serve the American people and make life better," he said. King noted that the latest CNN Poll of Polls showed Obama at 48 percent support among the American people, which the president called pretty good, considering the circumstances. "Given everything that's going on, my poll numbers are all right," Obama said. Asked about his anger toward the oil spill situation, Obama said he was furious because "somebody didn't think through the consequences of their actions." Obama also said he had not seen enough of a rapid response from BP to the environmental catastrophe. "I would love to just spend a lot of my time venting and yelling at people, but that's not the job I was hired to do," Obama said. "My job is to solve this problem and ultimately this isn't about me and how angry I am. Ultimately this is about the people down in the Gulf who are being impacted and what am I doing to make sure that they're able to salvage their way of life." Obama heading to Gulf coast tomorrow – but first on LKL tonight! President Barack Obama will return to the Louisiana Gulf Coast on Friday "to assess the latest efforts to counter the BP Deepwater Horizon oil spill," according to a White House statement. Meanwhile, after every effort to contain the undersea oil gusher in the Gulf of Mexico failed or fell short, BP devised a new strategy Thursday to cap the ruptured well, though the new plug will not be as tight as previously hoped. The oil giant said it would try again to slice off a damaged riser pipe and then place a containment dome over the well. But after an attempt to sever the pipe with a diamond-embedded saw failed Wednesday, the company will have to use shears that will not be able to make as precise a cut. Even if the attempt is successful, then the cap will not be as snug and oil will still be flowing out into the Gulf. Don't forget to tune in tonight and watch our interview with PRESIDENT OBAMA at 9pmeastern/6pmpacific!! A week of top guests for Larry King Live's 25th anniversary! LKL TUESDAY: TOP ENTERTAINER – LADY GAGA! The singer, songwriter, artist fashion icon and provocateur has taken the music world by storm! Get ready to learn everything there is to know about Lady Gaga! What do you want to ask Lady Gaga? Larry King Live turns 25 next week and we’re celebrating with interviews you won’t want to miss. LKL MONDAY: TOP SHOW – AMERICAN IDOL! Lee, Crystal and the 8 finalists are all here in one place for the first time since the finale! They’ll answer YOUR questions and tell us what happened off stage when the cameras weren’t rolling. Send us your questions and let us know what you want to ask this group of American Idols! Lady Gaga will be Larry's guest on Tuesday! What are your questions for LADY GAGA? American Idol Finalists, Bill Gates, and a surprise! Vote for the top 5 moments in Larry King Live HISTORY! Enter the LKL 25 Sweepstakes and for a chance to meet, and dine with Larry in LA.